Welcome to Save Hay.com | Hay Saving tips, products, and forums! The greatest expense in the production of cattle, or any livestock? The food they require – hay! SaveHay.com is dedicated to providing valuable information to you the AMERICAN RANCHER to help lower the cost of this food, increasing your profit. As you know, hay is the number one food for livestock, so we focus on the growth, production, storage, and feeding methods of hay. We’d like to invite you to browse on through the various pages, and articles on all types of equipment and materials used for livestock production including: future articles on cattle working equipment, corrals, fencing and even more HAY SAVING PRODUCTS . Why read our site? 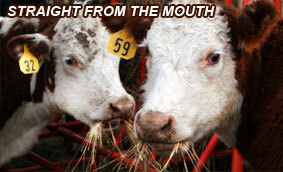 We are your source for stories from your fellow livestock producers. You can even share your own comments about products you have used, methods and experiences, and then share them with fellow readers here! How – just Submit a Story! Save Hay.com even hosts a free forum allowing you to share your experiences and opinions on saving hay and making your bottom line grow. What are the best practices for moving hay from storage to your cattle? What hay saving feeders work the best? What is the best way to store your hay? What are the best hay trailers to use for your needs? Need a bale trailer that loads it’s self, or just unloads it’s self? SaveHay.com allows you to read what Ranchers are actually using to save hay, and lets you share your experiences as well! NEW! SAVEHAY.COM OFFERS FORUMS FOR MAKING CATTLE MORE PROFITABLE! Looking to buy some hay? Find a local seller or a great deal? Check out our community powered Forum! It’s a group of forums and topics actually, organized by category! Check out our Forums! LET AMERICA HEAR WHAT YOU HAVE TO SAY!